Irish Distillers (IDL) has been mining the rich heritage of its various brands in recent years to relaunch the traditional single pot still Irish whiskey style. Now it's Paddy's turn, and no better year because it's exactly a hundred years since Cork Distilleries Company (which later merged with Jameson and Powers to form IDL) renamed its flagship whiskey in honour of renowned salesman, Paddy Flaherty. 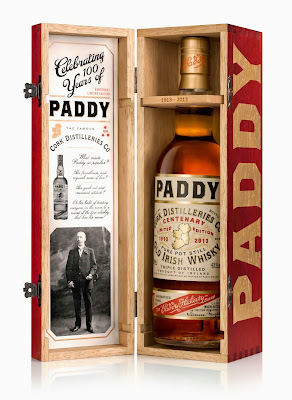 Paddy is a single-expression brand, a light and pleasant triple-blend of malt, pot still and grain whiskeys. A century ago though, it was a 7-year old pot still and that's what IDL has recreated now in a limited Centenary edition. The vintage label is a reminder that not all Irish distilleries spelled whiskey with an 'e'. Indeed, Paddy was still 'whisky' up till the late-70s, at least (see the stadium advertising in this 1977 gaelic football match, for example). The initial aroma of green apples quickly gives way to the rich spicy notes typical of well-aged Irish Pot Still Whiskey. Soft mellow barley grains are in balance with the more robust touches of tarragon and bergamot as associated with Paddy Irish Whiskey down the years. The initial mouth coating has a soft vanilla sweetness, from years of maturation in ex-bourbon barrels. Then the orchard fruits appear reflecting the proportion of whiskey matured in ex-Oloroso sherry casks. The evolution continues into the crisp succulence of freshly chopped green bell peppers. Long with sweet vanilla top notes balanced with a pepper prickle and fading to expose the delicate barley grains. It's available from this month in travel retail and specialist retailers in Ireland and France, priced at about €75. It arrived at the Celtic Whiskey Shop yesterday. According to shop owner, Ally Alpine, the allocation for Ireland is 1,500 bottles. I have no information about availability in the United States. Paddy has been distributed in America for just the past couple of years and only at very low levels but the coming year will see IDL put more focus and investment into developing the brand there.